W. W. Norton & Company. PAPERBACK. 0393337618 Great used condition. A portion of your purchase of this book will be donated to non-profit organizations. Over 1,000,000 satisfied customers since 1997! We ship daily M-F. Choose expedited shipping (if available) for much faster delivery. Delivery confirmation on all US orders. . Very Good. W. W. Norton & Company. Very Good. 2010. Paperback. 9780393337617 . Minor edge creasing. No marks, very clean copy. 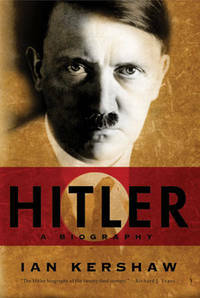 From artist wanna-be to Nazi radical, Kershaw details Hitler's rise to power, and the toxic world which allowed him that achievement. ; 1030 pages . W. W. Norton & Company, 2010-01-18. Paperback. Good. W. W. Norton & Company. PAPERBACK. 0393337618 *BRAND NEW* Ships Same Day or Next! . New. W. W. Norton & Company. PAPERBACK. 0393337618 *LIKE NEW* Ships Same Day or Next! . Fine. W. W. Norton & Company. PAPERBACK. 0393337618 Brand New Direct from the Publisher! Not overstocks or marked up remainders! Ships in a sturdy cardboard container with tracking! . New. W. W. Norton & Company. PAPERBACK. 0393337618 Remainder mark . Fine. W. W. Norton & Company. PAPERBACK. 0393337618 . New. NORTON W.W. & COMPANY, INC.. NEW. TRADE PAPERBACK. W. W. Norton & Company, 2010-01-18. Paperback. Used:Good. W. W. Norton & Company. PAPERBACK. 0393337618 Special order direct from the distributor . New. W. W. Norton & Company. PAPERBACK. 0393337618 Like New Condition. . Fine. 2010-06-01. Good. Ships with Tracking Number! INTERNATIONAL WORLDWIDE Shipping available. May not contain Access Codes or Supplements. May be ex-library. Shipping & Handling by region. Buy with confidence, excellent customer service! W. W. Norton & Company. PAPERBACK. 0393337618 New Condition. . New.